The screams...the grisly sound effects...the rumbling organ music. 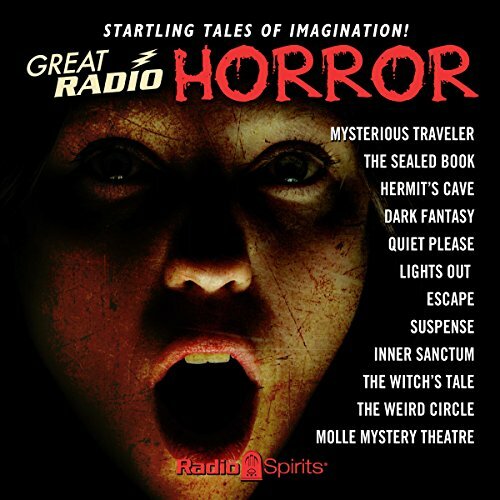 Sounds in the dark come strange, mysterious, and terrifying in 21 episodes of such classic series as Lights Out, Inner Sanctum, Suspense, and many more. Spine-chilling tales by Edgar Allan Poe, Guy de Maupassant, Arch Oboler, Robert A. Arthur, David Kogan, and Alonzo Deen Cole dabble in dark realms. Boris Karloff, Maurice Tarplin, Paul McGrath, and Bernard Lenrow deliver pulse-pounding performances as the haunted and the hypnotized who come face to face with forces beyond their comprehension. Episodes include: The Mysterious Traveler: "If You Believe" 12-29-46, "The Man the Insects Hated" 07-27-47; Escape: "The Fall of the House of Usher" 10-22-47, "The Golden Snake" 04-14-50, "The Abominable Snowman" 09-13-53; Inner Sanctum: "Corridor of Doom" 10-23-45, "The Dark Chamber" 12-11-45, "Cause of Death" 12-06-48; Suspense: "The Man Without a Body" 06-22-43, "Return to Dust" 02-01-59, "Waxworks" 03-01-59; Dark Fantasy: "I Am Your Brother" 06-05-42; The Hermit's Cave: "The Plantation Mystery 1940s"; Lights Out: "Mirage" 09-21-43, "The Haunted Cell" 07-20-46; Quiet, Please: "Let the Lilies Consider" 06-28-48, "Good Ghost" 10-24-48; Mollé Mystery Theatre: "The Beckoning Fair One" 06-05-45; The Sealed Book: "Beware of Tomorrow" 09-30-45; The Weird Circle: "The Rope of Hair" 1944; The Witch's Tale: "Rockabye Baby" 1934. ©2014 Audio programs released under license from series rights holders. (P)2014 Audio programs released under license from series rights holders. Good for nostalgia, I suppose. This is old time radio melodrama at its best and its worst. Tedious, overacting from the VERY old days of radio. I'm sure this scared the pants off people 50-60 years ago. I barely got through half. On the upside, if you are looking for a trip back to a time when horror was simplistic and radio took the time to go full-on production, then it is worth a listen... when it is half-price. 3 sur 8 personne(s) ont trouvé cet avis utile.